How the Heck Do I Take Care of Chromexcel Leather? A beauty on the eye, nappy to the touch, and a masterstroke on many dress styles, suede is both rugged and soft and it makes for a great addition to a boot collection. Still many remain scared of taking the plunge for a suede boot due to the extra care it can demand. As glorious as any suede boot may look, it can easily become the most annoying boot to care for. The fact is that unwaxed suede really does not do well with any liquid — water can alter the appearance of your suede to the point that it begins to look and feel stained. So, how can you ensure that your suede isn’t quickly condemned to one of those no-longer-in-use boxes sitting in your garage? What Makes Suede So Different? While I may not have initially appreciated this leather type, suede boots and shoes are a great addition to any wardrobe. It’s a unique type of leather. The leather is obtained from the underside of different animal hides, as opposed to the traditional “outside-in” leather. This gives suede some very unique characteristics and properties. It is thinner, softer, and more porous than regular hide, which can make it desirable for some and annoying for others. Suede may be used in its “natural” form or dyed to give it a napped finish. It is this tender, fuzzy feel of suede that gives it its rather delicate appearance. So, let’s get down to how you can maintain these boots, and get one of those problems out the way. An important part of caring for your suede is keeping it clean. This is one of those leather types where a simple stain, if poorly handled, could ruin its entire look and appeal. Remember to brush immediately after use with a suede brush like this one to remove any dirt or dust hanging around the fiber. A suede brush with a visibly fuzzy nap (such as a crepe brush) is recommended, but you can always use a brass wire brush for shorter suede fibers. Brush the suede nap in one direction to give it a clean and consistent look. Keep your strokes light unless you’re working on a stubborn stain. For tougher stains, a suede block (included with this suede brush) is ideal. Rub hard on the surface in back-and-forth motion to remove ground-in stains and smudges. Suede blocks have the added advantage of softening the leather and raising flattened naps. For stains that still won’t budge, treat with vinegar and rubbing alcohol. Although liquid in nature, these chemicals will not stain your suede like water would. Pour the chemical onto a clear white washcloth and rub into the stained area. Allow to dry and brush up the fabric to remove loosened dirt and straighten the nap. Whatever you do, do not use water to treat stains. What If Water or Liquid Gets Into it? Thankfully, finding water on your suede boot doesn’t have to signal the end of its life span. If your shoe manages to pick up water during usage or from spillage, quickly dry it off using a soft, clean fabric or paper towel. Dab over the affected area, applying some pressure until the moisture is absorbed. Now, dab the wet cloth lightly across dry areas until the moisture is spread evenly on the shoe surface.Once you’re done blotting, use your suede brush to brush the suede back and forth for a few minutes. Now it’s time to let them dry. Stick a shoe tree covered with a blank white paper in the shoe and keep to dry away from any direct heat. The shoe tree will help keep the shape as the paper absorbs the remaining excess moisture. Don’t attempt to speed up the drying by placing under direct heat, but it’s not a bad idea to use a hair dryer — gently — while brushing. To lift the nap of the dampened suede, consider using that suede eraser over the entire upper. What if you get oil on your suede? Immediately blot it out using talcum powder or cornstarch. Sprinkle the powder on the soiled area and allow it some time to settle into the leather. Wait until the powder begins to look oily, which should be about an hour or so, and then brush it off with a soft brush. Do this over until there is no trace of oil anymore. Then brush to restore the nap of the suede. 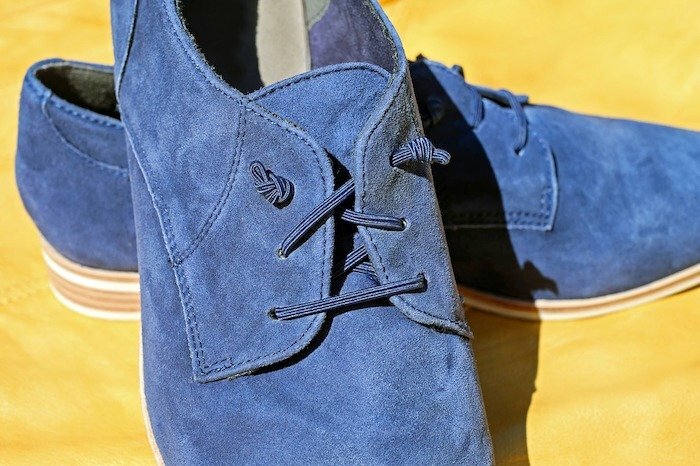 The best way to ensure your suede remains in excellent condition is to take preventive measures. One of these measures is to keep from using the shoe if there is even an off chance that it would be a wet day. You can also consider a suede waterproofing spray, like Kiwi’s Suede and Nubuck Waterproofer. This seal waterproofs your boot, and should be applied to the boot once it has been cleaned and is fully dried. Look for a neutral color waterproof silicone-based spray for optimum results. Remember to first apply the spray on a small, barely visible area to test for change in color. Do not over-saturate with the spray, and brush right after in a single direction. Then keep to dry in a well ventilated room. Another key aspect of keeping suede safe involves its storage. Do not wrap in plastic bag. The fiber needs to breathe, and should be exposed to as much air as possible. Also make sure to store away from sunlight to prevent shrinkage or fading of the fiber. Stuff a carefully selected shoe tree into the shoe or boot to help keep them in shape. For long storage, wrap in tissue and store in a shoe box. Suede care is not half as impossible as its legend. Your suede boots may require extra care, but they also respond well to the right treatment. So long as you protect them from water, clean them often and with the right materials, and store in fully aerated areas without the risk of moisture, you should do just fine. When the time comes, simply brush them up and put them on to give your ensemble a classic finish. Studio d’Artisan G-003 Denim Review: The Hairiest Jeans on Earth? Do you want to dress better? See which boots suit your preferences and style. Thursday Captain Boot Review – How Is it So Cheap?! 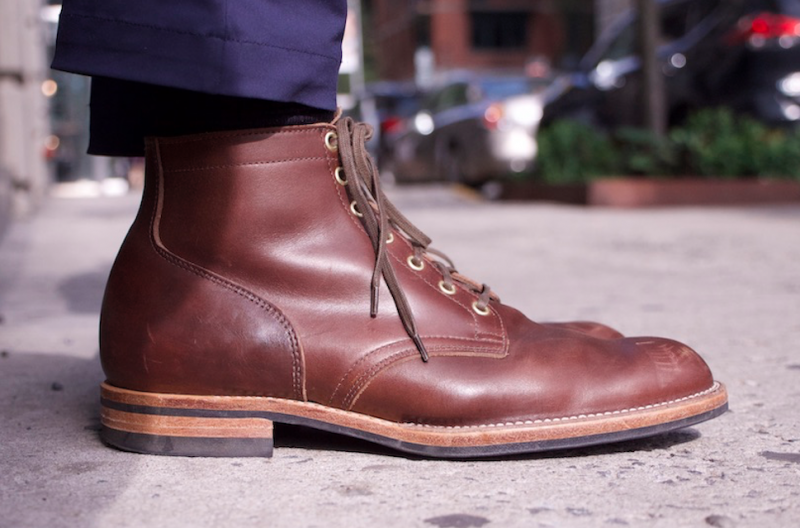 Viberg Service Boot Review – Is It Seriously Worth This Much Money? 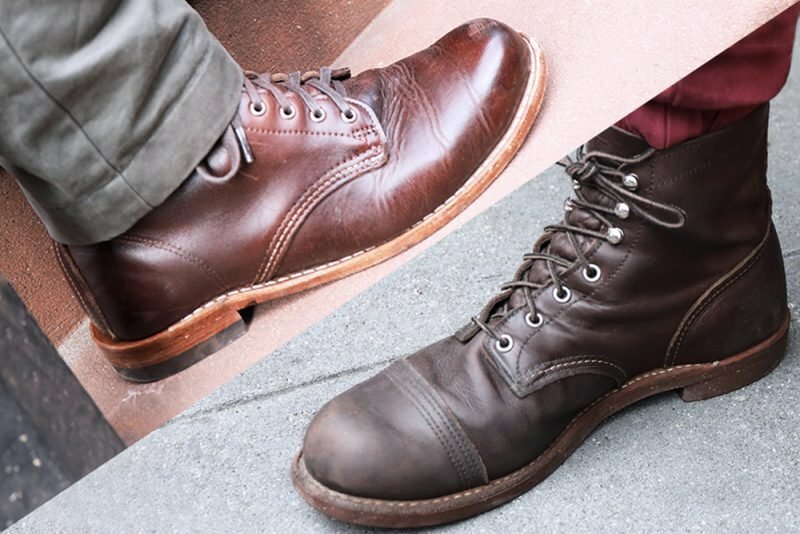 Red Wing Iron Ranger Vs. Wolverine 1000 Mile – Which Is the Best Men’s Boot? 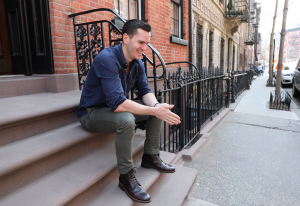 I was well into my career as a journalist in New York City before I finally realized that grown men don’t walk around town in sneakers and, when it’s a little rainy, rubber galoshes. That the first item of clothing a date looks at is your shoes. That there are a lot of subtle differences between boys and men but a well put together outfit with a sturdy pair of boots is one of the clearest signs that a guy cares how he is perceived by the world. If you want help deciding exactly which boots are for you, let’s talk! I made this site because I love men’s boots and want to explore the industry and the fashion with my readers. To keep the lights on, some (not all) of my reviews contain affiliate links. That simply means that if you click the link and make a purchase, I may receive a small commission for sending you there. This does not cost you any extra money whatsoever, it just means the origin of the sale is tracked back to Stridewise. If you’ve read a few of my reviews, you know that I never hesitate to criticize an aspect of a boot that needs criticizing — and I’d never recommend anything I didn’t love.